Wrangling your cat and getting them into a carrier can be a very stressful event. This can put you off bringing your cat to us and it means they might miss out on essential health check ups, vaccinations and preventative care. If you think about it, in your cat’s mind, nothing good comes after being shoved into a carrier. While our canine friends get to leave the house for pleasurable walks and trips to the beach, most cats are invariably taken somewhere a lot less exciting! Remember that all pets should be secured in the car, not just for their safety but also yours. First up: ask us about the pheromone spray we have available to help your cat feel more secure and safe while in the carrier. Bring a towel that smells like home to cover the carrier when you arrive here. Try not put the carrier down near a strange dog – that instantly creates stress. At home, store the carrier in a part of your house that smells familiar. Give your cat the chance to rub her scent on the carrier. Try to associate the carrier with good things! Place food in the carrier or special treats (ask us for the best recommendation). 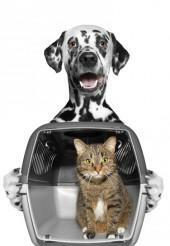 We will happily recommend the best carrier for your cat that is both safe and secure – call us today. !